Looking for an excuse to play with my RubyMotion license, I decided to dive into Joybox. It's a very new framework, so there's definitely some dragons here, but creator Juan Karam and his team are actively improving it. (And it's open-source, so you can help improve it too!) There are a few official examples available, but I wanted to go a little deeper and understand how to put all the pieces together. I decided to put together a tutorial for a simple Memory game to help other beginners get started. I'm going to assume that readers are familiar with Ruby and basic game development terminology. Let me know in the comments if I need to dive deeper on something! If you have any questions or run into any issues with Joybox, feel free to post to the Google Group. Juan has been very responsive to questions so far, and we'd love to see more people using the framework! The completed source for this tutorial is available here. If everything is installed correctly, you should be able to complete the Hello World step from the RubyMotion instructions and the Getting Started step from the Joybox instructions. Nothing too fancy here. It creates an app_delegate, which is the entry point to an iOS app, a Rakefile for RubyMotion, a few default images, and a test stub. I'm not going to do any testing in this tutorial, but I might cover this topic in the future. Not too exciting, but it's a start! Because Joybox is so new, there's lots of bug fixes and improvements happening in master that don't immediately get cut into a gem. I'm going to use a few of these improvements, so let's take advantage of Bundler here. Bundler is a dependency manager for Ruby that helps you maintain some sanity in your environment. Run bundle install then rake one more time to make sure everything is in order. Let's take a quick look at the app_delegate file to understand what Joybox did on our behalf. In Joybox, there is an object called the director that is responsible for controlling the game loop itself. It handles things like double-buffered drawing, pausing, resuming, and so on. 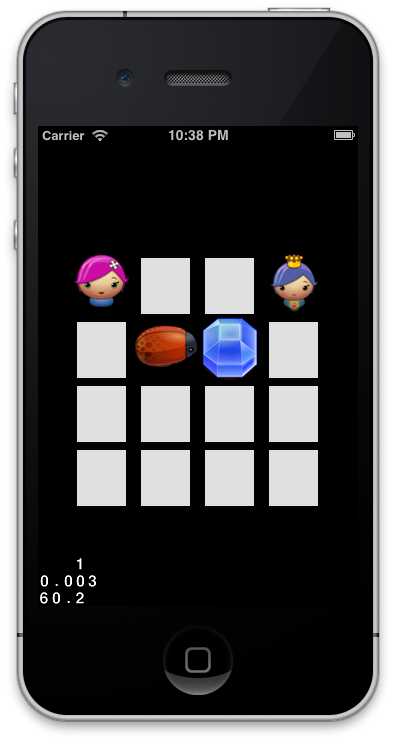 The Joybox iOS template fills in our app delegate with basic handling for these cases, so we can focus on the core game logic. There's nothing too fancy in here, so we'll keep moving. Sprites represent most interactive objects in a game. Player characters, enemies, power-ups, bricks, and walls are all examples of things that a sprite can represent. 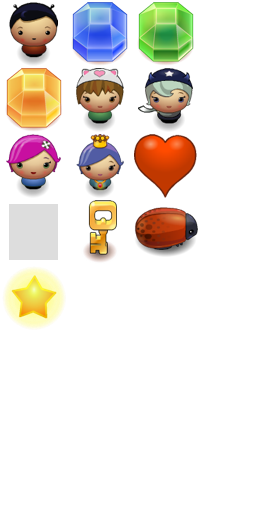 In Joybox, sprites contain information about what to draw (the image file), where to draw it, and how to react to collisions, among other things. In our simple memory game, we won't deal with collisions and more complex features of sprites, but know that they're available. There's a basic collisions example called Gorillas in the Joybox-Examples repository on GitHub. The Sprite class is intended to be subclassed in Joybox. We'll see an example of how to subclass later in the tutorial. Layers manage drawing and user interactions. Layers have two main methods: on_enter and on_exit. 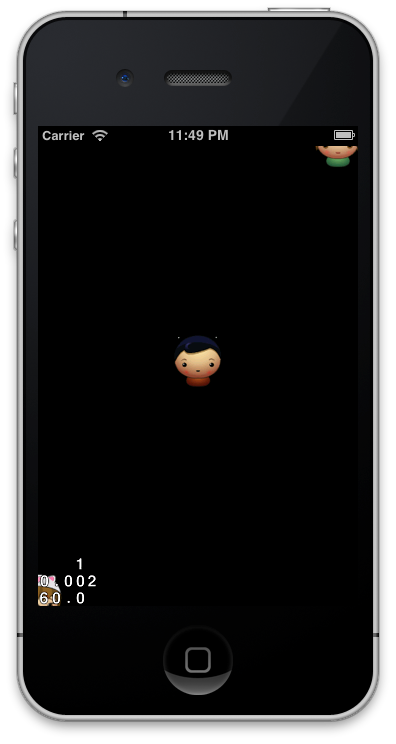 In on_enter, you tell Joybox which sprites to draw and how to respond to touch actions. We won't use on_exit in this tutorial because we only have one layer, but it's where you would clean up touch handlers and sprites if you needed to swap in another layer. Like Sprite, Layer is intended to be subclassed, and we'll take advantage of that in a bit. At a high level, scenes represent screens within your game. Examples include your start screen, menu screen, pause screen, cutscenes, level screens, and so on. A scene manages one or more layers. This allows us to instantiate a scene without having to create a really boring class to represent it. You might be noticing a hierarchy here. Unsurprisingly, the director manages the scenes, which manage the layers, which manage the sprites. We won't need to do much with the director in this game, but it's a nice object to have around. As I mentioned before, we don't need a full-fledged scene in our game, so we'll use the implicit scene functionality in GridLayer. Notice that scene is a class method, not an instance method, so we'll invoke it with GridLayer.scene. on_enter is a special function that Joybox calls out to during layer construction. This is where we'll set up most of our sprites and touch handlers, but for now, we'll just puts. Run rake. You should see a blank screen still, but in the REPL that comes up when rake finishes compiling the code, you should see "Entering GridLayer…"
This works well for small numbers of sprites. When you're dealing with lots of sprites, though, it's better to load them all into memory using a sprite sheet. Basically, you load every frame from this sprite sheet into your game, then just tell the game which frame to draw for standing, running, jumping, fighting, and so on. The .png file contains the actual sprite sheet. The .plist file is used by Cocos2d to allow you to say things like "Give me running frame #3" and know that "running frame #3" is at 100, 200 in the .png file and has a height of 50 and a width of 64. It's just a simple XML file, so take a quick look and make sure I'm a reliable narrator. Add these two files to your /resources directory. Can We Draw Something Yet? @sprite_batch = SpriteBatch.new file_name: "sprites.png"
As discussed in the previous section, SpriteFrameCache tracks the location and dimension information within the sprite sheet by using the .plist file, and SpriteBatch loads the actual images into memory. We also need to make the layer aware of our SpriteBatch object so we can draw sprites. We do this by adding our SpriteBatch as a child. This will look up the frame called 'boy.png' in the .plist file, find the associated image, and draw it in the middle of the screen. 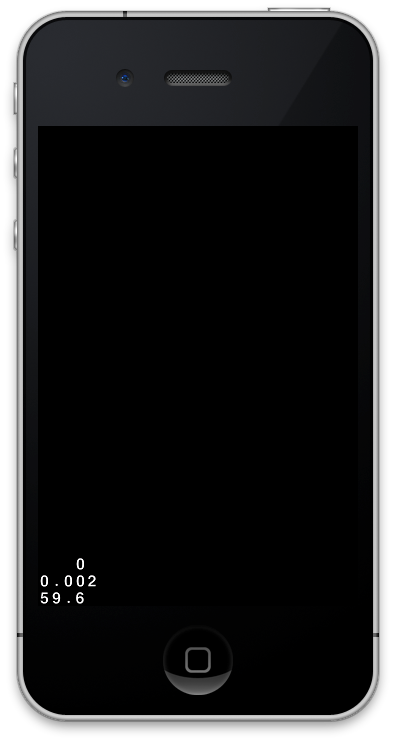 The top right corner of the screen is 320x480 (in pixels) for a non-Retina iPhone. If you're running your simulator in Retina mode, you may see different results. Also notice that the character is centered at the specified point. For example, we only see the top-right quadrant of our Cat Girl at [0,0]. on_enter is going to get bigger, so it makes sense to tidy it up a bit now. Before we move on, let's do a little bit of cleanup. You might have noticed a couple magic numbers above (64 and 128). Our tiles are 64x64, so the row * 64 and column * 64 is probably referring to the size of each tile. Let's add a constant called TILE_SIZE and set it to 64. Similarly, the 64 and 128 that we're adding represent the distance from the left and bottom of the screen, so let's call those LEFT_GUTTER and BOTTOM_GUTTER. Run rake one more time to make sure we didn't break anything. If it looks good, let's make our Tiles a little more interesting. 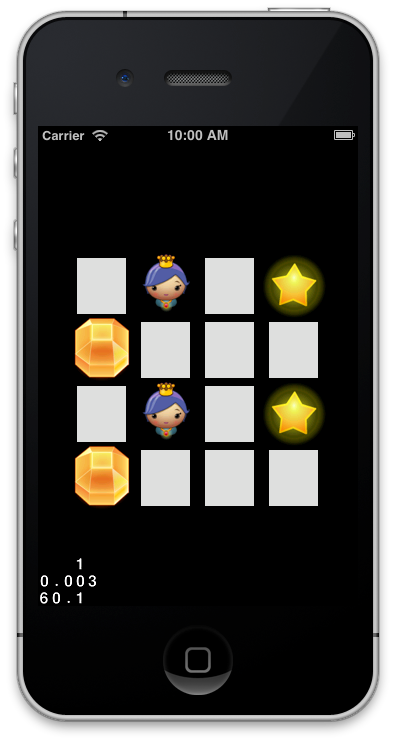 Right now, our "Tiles" are actually just sprites. Eventually, we want to do things like give each tile a different image, flip tiles between hidden and showing, freeze tiles that have been matched, and so on. In our simple memory game, we don't need to worry about dragging or multitouch, so we only need to handle the on_touches_ended callback. There are also callbacks for on_touches_began, on_touches_moved, and on_touches_cancelled that you can use for more complex games. on_touches_ended provides an array of touch objects. If we needed multitouch, we could process all of the objects in this array. Since we only care about single touch, we'll go ahead and use the touches.any_object. Run rake again, and try clicking around on the screen. You should see some x and y positions being logged. If you click and drag, you'll notice that the event isn't logged until you release. This is because we're handling on_touches_ended, which only fires when the tap is completed (like mouseup/keyup events in web programming). CGRectContainsPoint is more performant and saves us a bit of code, so we'll take advantage of it. Run rake again and click around. You should be able to tell which tile is about to get flipped. All this plumbing is about to pay off for us! Printing console messages is nice, but we're making a game, so we should have some sweet animations when the tile gets touched! But this is just a tutorial, so I didn't have time to invest in sweet animations. 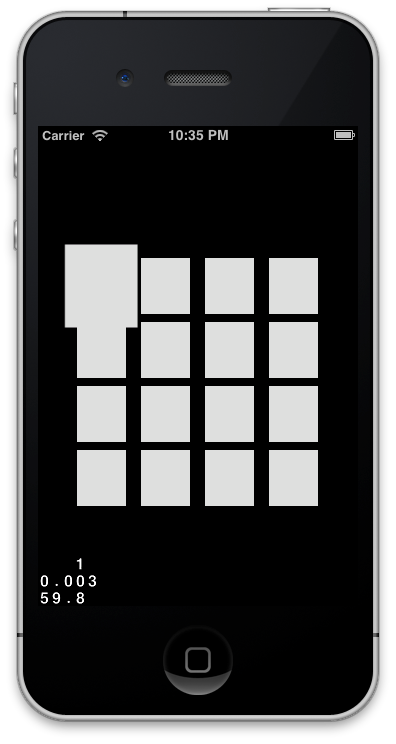 We're going to use some of the built-in Joybox animations instead. It won't be a real flip, but it'll be good enough to impress at least one our your friends. Run rake and try tapping on your tiles. You should see them scale up to 150% of their size over 0.2 seconds, then shrink back to normal. # will end up half of the original size! This will let us figure out which image needs to be drawn when the time comes. 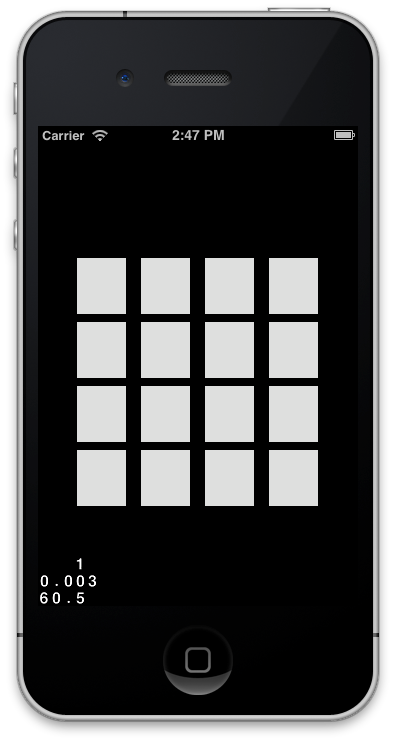 Next, let's update our GridLayer to pick 8 pairs of tiles that can be matched (4x4 = 16 = 8 pairs). I'm going to use a bit of Ruby cleverness here, but I think it expresses the solution well. In Ruby 1.9+, Array#sample returns a random element from the array. We want to do it 8 times and collect them into a new array, so we use times.map. Go ahead and run rake again. We can actually flip our tiles over now! Wait a minute. The tiles stay flipped even when they don't match. That's not much of a memory game. Let's fix that. "Why must you analyze everything with your relentless logic?" We need to add the matching logic in at this point. We need to track up to two active_tiles. Once two tiles are selected, we'll see if they're the same type of tile. If so, we want to "freeze" them so they can't be flipped back over or used in another match. If not, we flip them back over and try again. Let's deal with our Tile first. For starters, let's add the ability to flip a Tile back over. If the current frame is "hidden.png", we want to switch it to the Tile's type. Otherwise, we want to switch it back to "hidden.png". # Tiles are the same type -- match! Add a quick attr_reader :type to your Tile class, then run rake. You should get some feedback on whether two tiles are a match when you tap them. Take a deep breath, run rake again, and play your game. If everything went well, matched tiles should stay matched, unmatched tiles should get flipped back over, and you should be limited to two selections at a time -- just like you would expect! Your game is completely playable except for one thing: it doesn't tell you when you win. 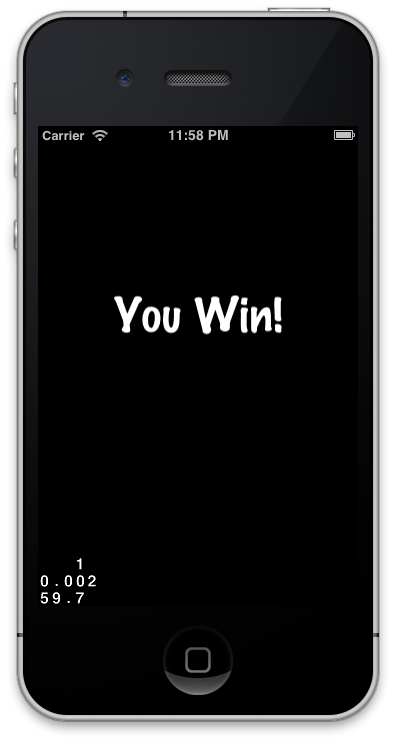 That's pretty lame, so let's add a win screen. It won't take long, then you can make all your friends relive their childhoods by playing your awesome memory game. I hope you've enjoyed this whirlwind tour through Joybox. There's obviously lots more inside, and many more kinds of games you can make. I just made a handful of grid-based games and thought I'd share some of the stumbling blocks I ran across, as well as some of the ways to handle game logic as your game becomes more advanced. There are many ways you could grow this tutorial: adding more rows/columns, keeping track of the number of moves, adding a timer, and so on. Feel free to share your hacks and extensions back to the Joybox Google Group or to me directly. I'm looking forward to seeing some cool games built with Joybox. Happy coding! You can find me on Twitter if you have any feedback.